The Hopi of the American Southwest call one of their ceremonial pipes natwanpi — literally, “instrument of preparation”. As words do, this one stuck with me ever since I read it, decades ago now. No wonder: we need markers for passage into sacred time, because otherwise it can burn and blow right past us. 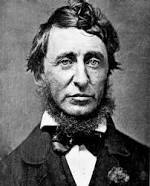 Or, to shift metaphors, if we don’t catch the sacred wave, we can’t surf in sacred time. We miss that tidal flow, then wonder why life can seem flat or dis-spirited. With a beloved festival like Imbolc calling us, what better time to consider how we can attune to sacred times and sacred tides? almost four meters in length … [and] serves as a marker for the gods descending to this world. In ancient times, bonden used to be made of paper or rice straw, but in recent years, they are often made by decorating a bamboo basket with colorful fabric. The bonden wands are carried by groups of children, townspeople, or even company employees. Each group entrusts the bonden with their prayers for an abundant harvest, good health for their families and success in business. 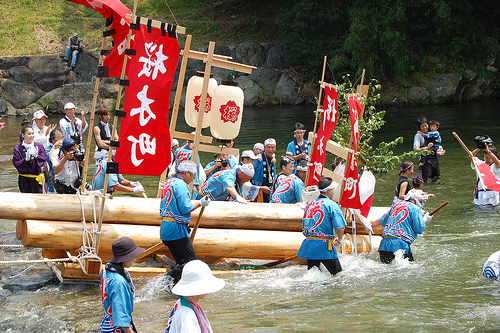 Bonden-sai is intimately associated with Akita Prefecture in Northwest Japan. Akita is also famed for its onsen (hot springs) and mountains, and Mount Taiheizan, the symbol of Akita City, is a major site for the festival. Bonden-sai there means a vigorous race up the mountain with your bonden to procure the blessings of the gods. Shinto and Japanese culture, so long linked, have celebrated the sacred in so many things that the secular West allows to pass unremarked. 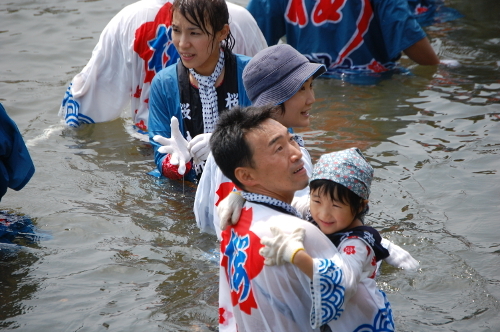 Whether it’s drinking tea or sake, or bathing, or marking the calendar with a plethora of festivals, Japan models practices the West and particularly western Paganism learn from, build on and delight in. Because when the gods are dead, the human heart also dies a little every day. You certainly don’t have to “believe” in them as any kind of prerequisite, any more than you have to believe in anything in particular to celebrate Halloween or Christmas or MLK Day. The gods themselves can serve as a kind of natwanpi, a means of preparation. Belief, like so much else, is a tool, a strategy, a technique for connecting to things other than ourselves. Use it skilfully, delicately, consciously, I’m learning, and it repays the respectful treatment. Ultimately it’s the impulse to celebrate that’s the flame to cherish. And if it chances on occasion to be gods that help it happen, as one of the forms the sacred can take, why exclude them out of hand, just because they’re gods? As for me, I try to take advantage of any natwanpi that comes my way. And if I succeed and connect only 30% of the time, well, isn’t that a very respectable baseball batting average?! 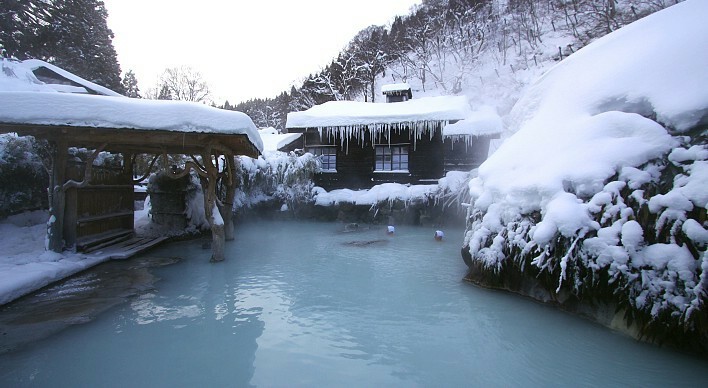 Images: Bonden in Akita; Nyuto Onsen. 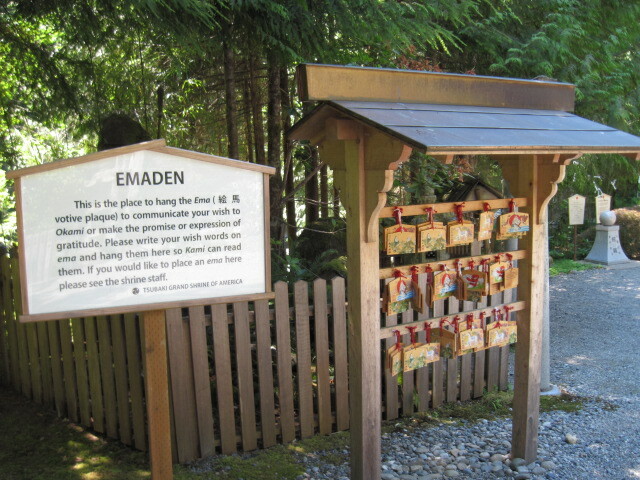 I’ve mentioned Shinto and Tsubaki Grand Shrine before in these pages — a lovely shrine in Granite Falls, WA, about an hour north-northeast of Seattle. Recently during our car tour that included the Pacific Northwest, my wife and I “made omairi” or paid a visit on a sunny July day. 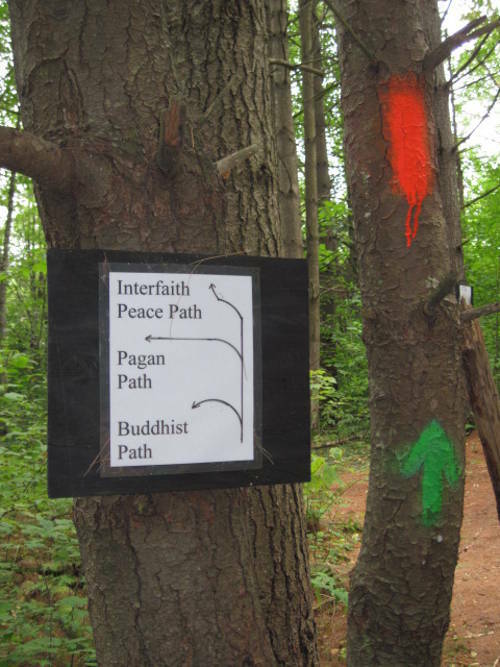 The idiom “pay” is illuminating: some kinds of visits can be the fulfillment of a religious vow, a pilgrimage we dedicate to a spirit or an ideal — acts, in other words, performed at least potentially in fuller consciousness than usual. True, “the bow can’t always be bent,” as the old occult proverb goes; we “have to live in the real world,” as my mother used to admonish me. But you quickly find that cultivating regular times of intention and focus brings spiritual advantages just as it does other kinds of advantage in other aspects of life. Tsubaki finds a working balance in explaining just enough about itself and about Shinto to the visitor who may know little about either. Shrines express unique and individual presences, and Tsubaki is no different. 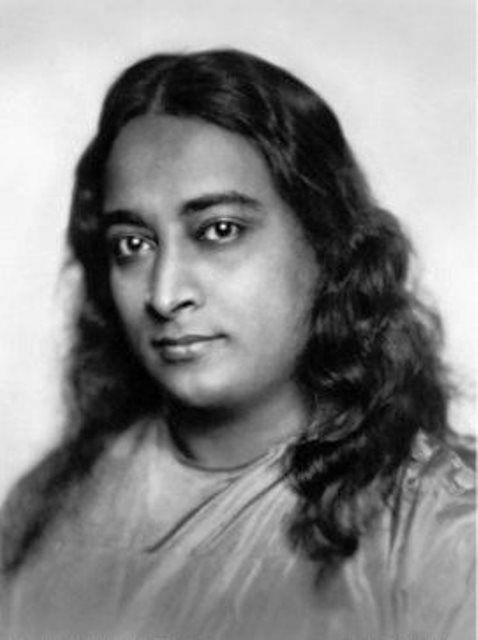 We can argue till the cows come home and make their own butter whether such distinctiveness comes from human intention solely, or from a happy cooperation of human and divine. What remains is the shrine itself, beyond mere debate: a place to visit, breathe, absorb, reflect on, and if you feel called to do so, revere and commune. Tsubaki aids visitors in doing this. 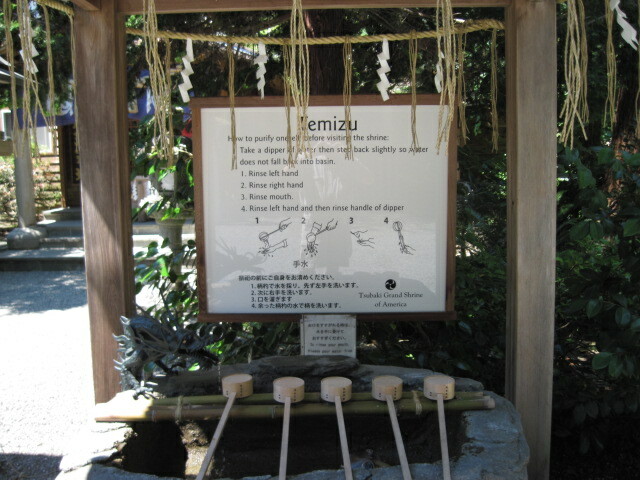 Here is the shrine’s temizuya, literally, “hand-water-place,” a feature at most shrines, offering an opportunity for ritual purification. 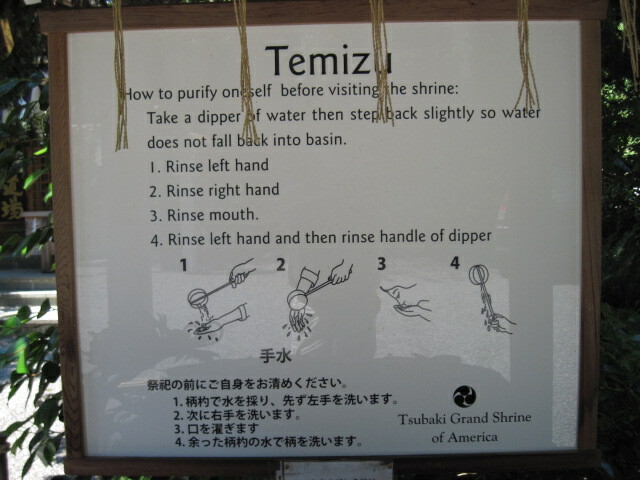 The shrine offers a bilingual placard explaining the temizu ritual. Participating (or not) is left beautifully up to us, especially on a day like this was, with no one around but one silent shrine tender, sweeping and cleaning. But the temizuya does stand ready as one invitation among many to make our own discoveries through performing a small ritual action. Of course, a shrine need not always explain. Tsubaki, like so much of Shinto, also demonstrates the value of silence in fostering encounters with the natural world. They are not separate things; the human is part of the world of the kami, of spirit. From another viewpoint, a shrine simply acknowledges what is already present, whether it chooses to point our attention to it, or bring us together by putting us in the same place. 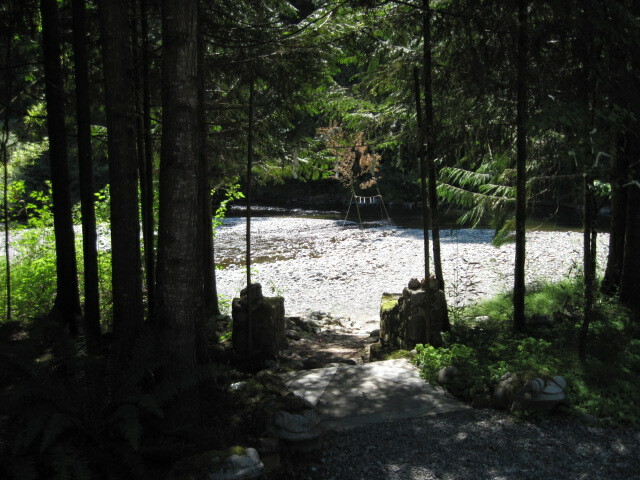 Here is the path from the central shrine down to the gravelly bed of the Pilchuck River. There you can see another small shrine (in the center of the picture, looking something like a tall sawhorse draped with white flags) standing near the water’s edge. 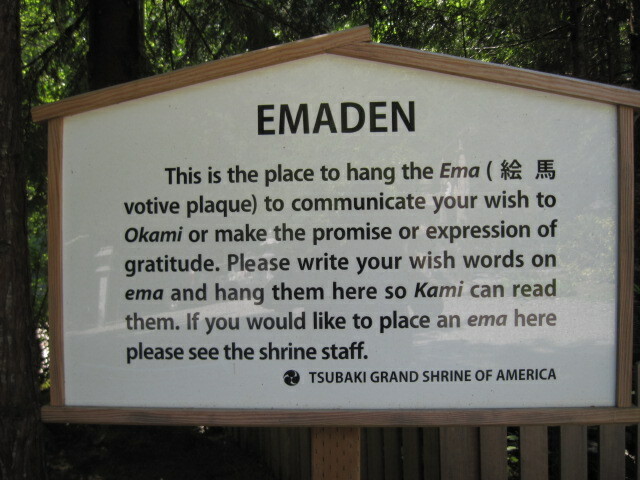 The plaque above adjoining the emaden explains another Shinto practice. 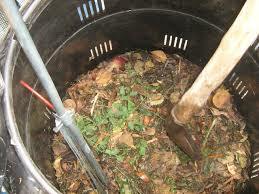 Below is the emaden itself. 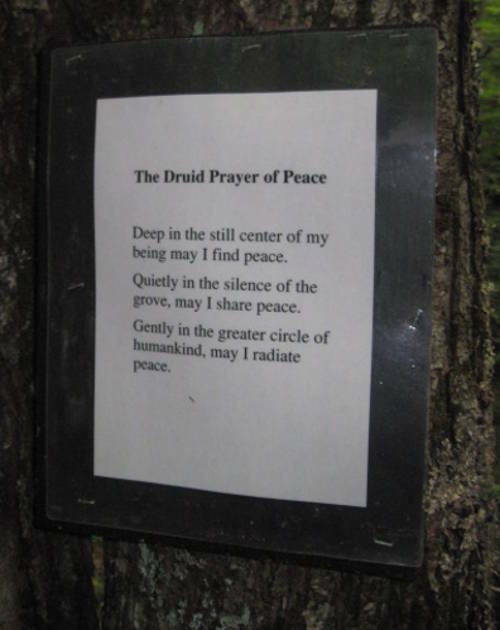 Less formal are the written prayers tied to natural features like trees and to man-made objects. And many Westerners have become familiar with Tibetan prayer flags. Odd that in the West a prayer is considered primarily a verbal action. The silent written prayer can stay in place; we can walk away, knowing our petition or vow or praise or thanks remain, where we made them. 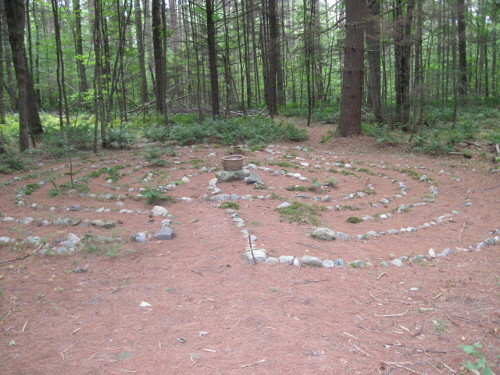 We wish for a change, a response, to manifest at least in part in this natural world. Then let our petition, our expression, our acknowledgement of spirit linger in the world, till the world’s elemental and spiritual forces reclaim them. In addition to other kami, Tsubaki also enshrines America Kokudo Kunitama-no-Kami, the kami protector of the North American continent. 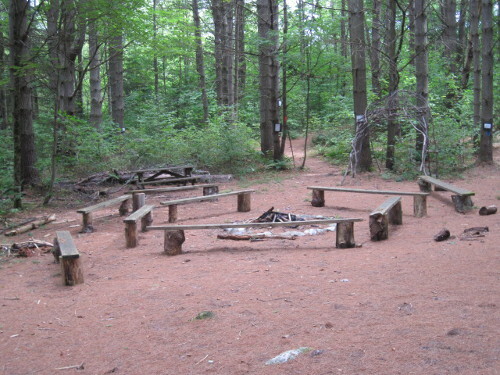 In the next post, I’ll look at some possibilities for what Shrine Druidry could look like as an expression of Druidic experience. 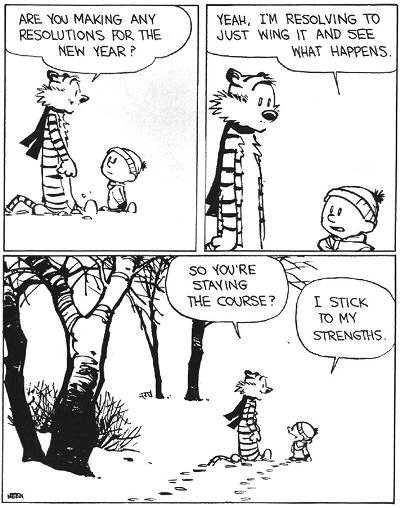 Sometimes I just need to back into it, the destination that feels nearby, though I can’t see it. “Returning is the motion of the Tao” (chapter 40). 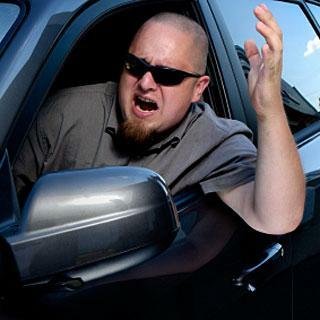 Because if I try it head-on, all the old defenses go up like a bad reflex. An old i holds on even as a new one moves in. They spar a little. But what are wood and water doing while I stare at an i? Participate in our own becoming. A call, if we choose to hear and heed it. Make it day when it’s night (for our next trick, do it without using electricity). Or vice versa, turning off the glare of the spotlight on the self which isn’t the whole story. After all, “five or six years old” is about right: didn’t that crazy Galilean say we need to become like little children again? Is that “being yourself”? Like is important: we can all imagine it, approach it, approximate it. Journey towards it. Try out “yes” till it drops the ” ” — that little chicken scratch that distracts us from so much. Or become the chicken that makes the scratch. That’s a power we’re granted, too. Shape-shift at will and need. One thing becomes another, in the Mother, in the Mother. Thanks, Mom. Can faking it make it real? Well, the pressure’s off if all I need to do is fake it. (e. e., you saw it, said it elsewhere: “i thank You God for most this amazing/day: for the leaping greenly spirits of trees/and a blue true dream of sky; and for everything/which is natural which is infinite which is yes”). And if “You God” doesn’t work for you, insert your own addressee of choice. Need a spell to make it happen? “Power of choice I grant thee, I grant thee, I grant thee.” O.K., proceed. Site stats show that my previous posts on Shinto are among the most popular here at A Druid Way. The reason for that can’t be too far to find. We crave like a food-hunger a spiritual reality that does not depend on belief (or at least not on belief alone), but is present to us whenever we’re present to it — and even when we’re not. We may hunger for a Way or Ways, just like we yearn for dark chocolate or hot sauce or beef or fresh limes in guacamole (insert your favorite food hunger here), a harmony that we can begin to fall back into at any moment, wherever we are, just by shifting our attention, and restore a sense of balance and integrity. And not just a sense of them, but its reality — a poise for living that shows in our words and deeds. We’ve all known this harmony, witnessed it in others, however briefly, which is why we can feel so disheartened when we lack it, when we’ve lost it, fallen out of it. We know it’s possible because it’s there, in living memory, however far we stand from it right now, in this grubby, muddy present moment. 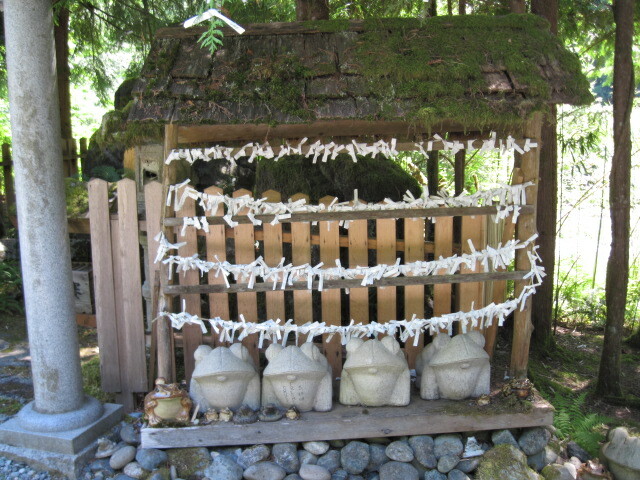 We’ve even got a Shinto shrine in the U.S., the Tsubaki Grand Shrine in Washington State, if we need the reminder. Which is what a shrine, among other things, persistently tries to be. It’s here, all around us, what we seek. And a few among us imported Shinto as a recognition of that consciousness, as a support for us when we lose our way. From it we can jump-start our own (there’s a possessive pronoun again) American Shinto, if we desire it, if we give it space to manifest. The kami know and dwell in America, too. see shrines as both restful places filled with a sense of the sacred, and as the source of their spiritual vitality – they regard them as their spiritual home, and often attend the same shrine regularly throughout their lives. 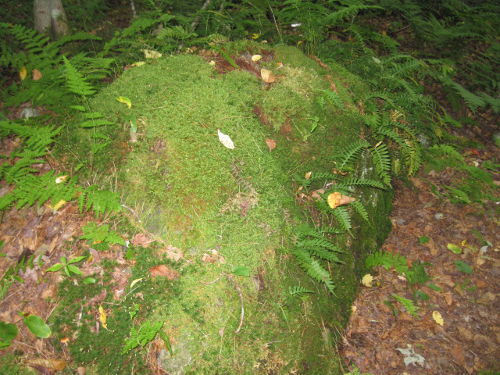 Shrines need not be buildings – rocks, trees, and mountains can all act as shrines, if they are special to kami. 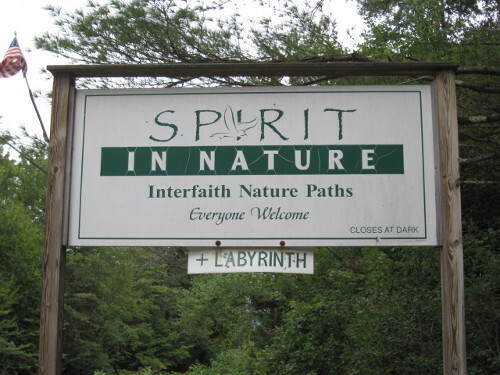 Physical world as spiritual home: what a change that would make in us if we carried that knowing with us all day long. 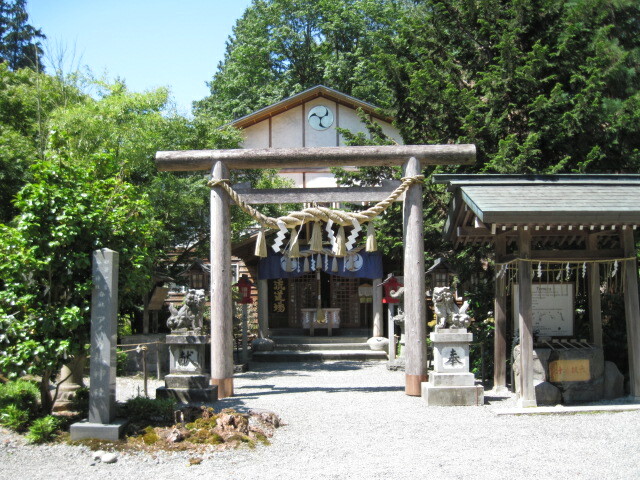 A large shrine can contain several smaller sub-shrines. 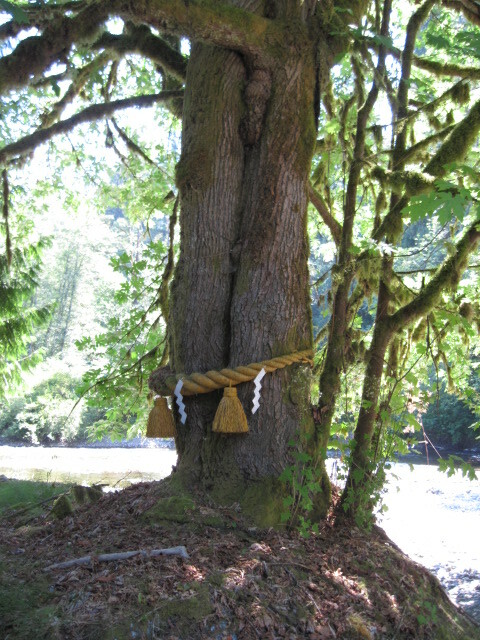 Shinto shrines can cover several thousand acres, or a few square feet. 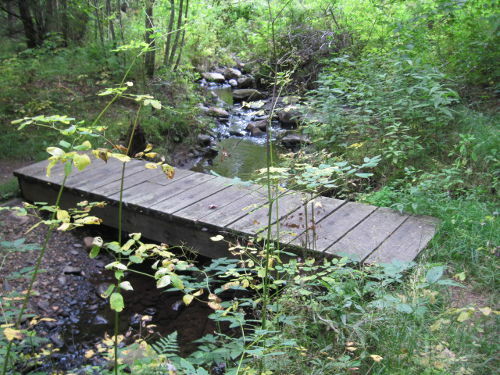 They are often located in the landscape in such a way as to emphasise their connection to the natural world, and can include sacred groves of trees, and streams. How many of us find the kami in a garden, a window pot we lovingly water, a bird feeder stocked through winter, or whatever season in your area that otherwise challenges the small feathered lives around us? Various symbolic structures, such as torii gates and shimenawa ropes, are used to separate the shrine from the rest of the world. Separation as a reminder — not that one exists like some line in the sand, but one we need, in order to notice what’s right in front of our noses. And so I remember to bow at the willow at the bottom of the hill where our house sits. I talk to the crocuses. Sometimes I forget. Then I remember again. Muslim mystics chant the dhikr, literally the “Remembrance” of that one Name ringing just behind our day-to-day awareness. Or many names, each waiting to be cherished, each a kami, each a potential doorway to what we seek. In a world of seven billion persons, a grand synthesis, a God for everyone, may not be feasible at this point in our consciousness. 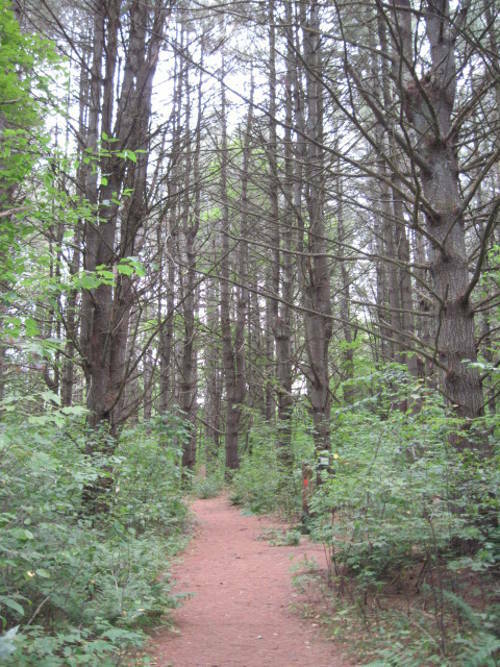 But we can reverence that lopsided pine down at the corner, honor the robins and starlings on our lawn, respect our own bodies on this earth, and begin, again, to find our ways. Isn’t that much of the promise of spring (and of so many of our human stories) — starting over? The growing shout of green, the rising sap, birdsong and peepers calling into the night, what we call spring fever in our veins and nerves and sinews, obeying an old law we’ve almost forgotten. 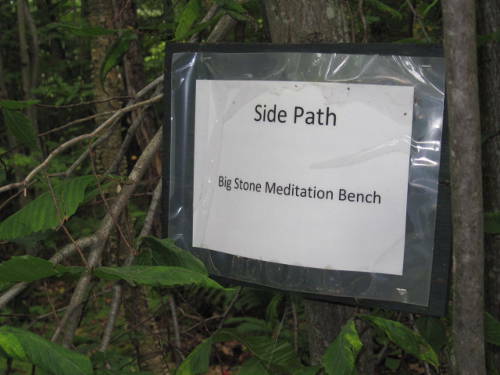 Well, Shinto in the West is automatically different from Shinto in Japan. For some reason, Japanese immigrants and their descendents don’t seem to keep practicing Shinto very much, perhaps because of the difficulty in practicing a shrine-centered, community-oriented faith in a place with nearly no shrines (I can count the ones I know of on one hand!) and a very small and scattered community. So, most of the North American practitioners I know of are of European ancestry, trying to practice Shinto alone and without shrines, and learning what they know from books. Many have some sort of cultural connection to Japan – either they’ve studied it academically like you, or else they have married a Japanese person, or they lived part of their life there, or have learned a bit about Japanese spirituality through the martial arts community. We have to adapt the religion to our new environment, e.g. finding replacements for unavailable supplies, translating prayers from Old Japanese into English, and trying to answer hard questions like, should we honour the spirits of Japan or try to identify the spirits of our own environment? 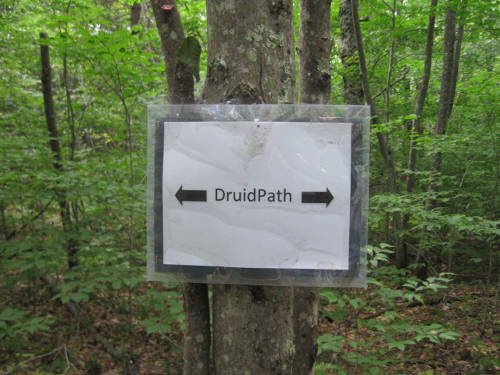 Druids have built their own shrines, and begun to listen to the spirits here on the North American continent, which differ from European or Asian ones. Just the act of listening opens many doors. What we often lack is the support of a community in our practice. Many have the strength of self-discipline to sustain a solitary practice, but others need the interaction, inspiration and community spirit that can help through the arid periods where nothing seems to be happening and we’re stopped dead in the water. For that reason alone many Americans stick with Christianity or Judaism, because it offers that support, even if they also seek out other founts of spiritual nourishment in places their Abrahamic fellow-religionists might balk at. It’s the reason behind “spiritual but not religious,” which ultimately is often hard to pull off in practical terms, because spirit seeks a form, a practice, if only to come true to us, to enter our physical lives in manifest ways, as Oliver’s poem above reminds us. We do this and not that because it works. Any claims about earlier or better or more spiritual or, Goddess help us all, divinely inspired and uniquely true forever and always, come along after. Mary Oliver. Dream Work, Atlantic Monthly Press (Boston, MA), 1986. 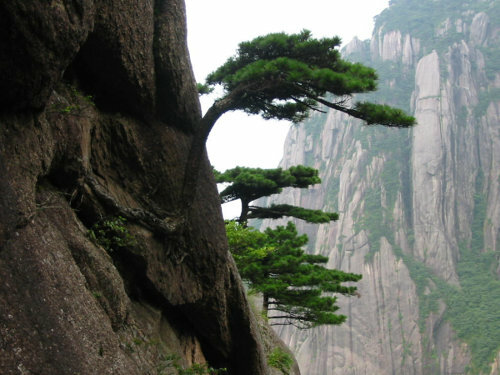 Images: trees on cliff; Tsubaki Grand Shrine images (homepage auto-sequence), accessed 9 May 2014.